It's an Easter-Egg-Stravaganza! Celebrate Easter and the return of Spring at Raffaldini Vineyards. Bring the whole family and feast together over an Italian-style buffet brunch along with award winning Raffaldini wines. An Easter egg hunt for the kids will take place on the lawn following brunch at 2:30pm. Our annual cheese rolling competition, Ruzzolone, will be held at 1pm & 3pm. The victor of each competition will receive cheese from our partner Heritage Homestead goat dairy. Join Owner Jay Raffaldini on a moderate hike around the Raffaldini property! Wear sensible walking shoes and prepare yourself for a delightful morning out. The hike will be followed by a hearty luncheon of soup, salads, sandwiches and wine! $50 plus tax per person includes the hike, lunch and two glasses of wine. 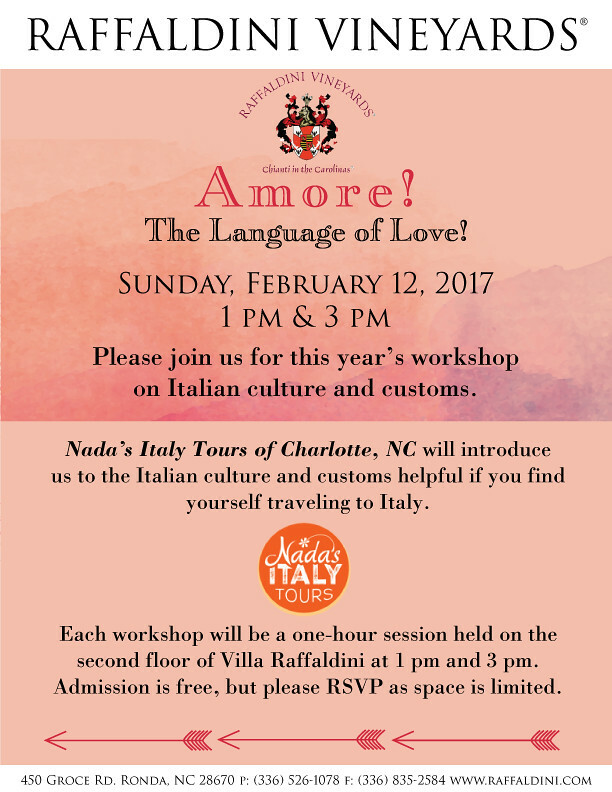 Enjoy a traditional Italian-style afternoon of food and wine as we grill salsicce (sausages), drink wine and play bocce at the winery. 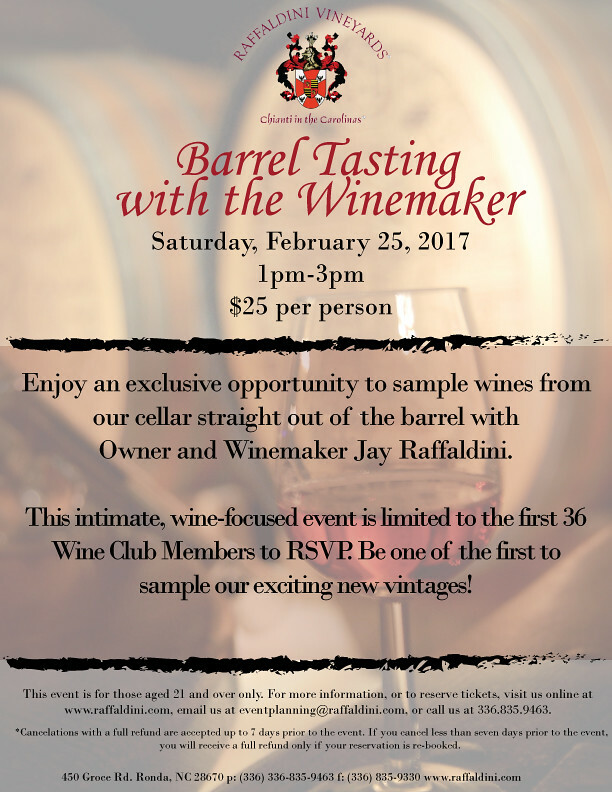 This event is hosted by Jay Raffaldini and is sure to be a relaxed and enjoyable Saturday afternoon. Ticket price is $50 plus tax per person and includes admission to event, a luncheon of grilled sausage and assorted sides, and two glasses of Raffaldini wines. 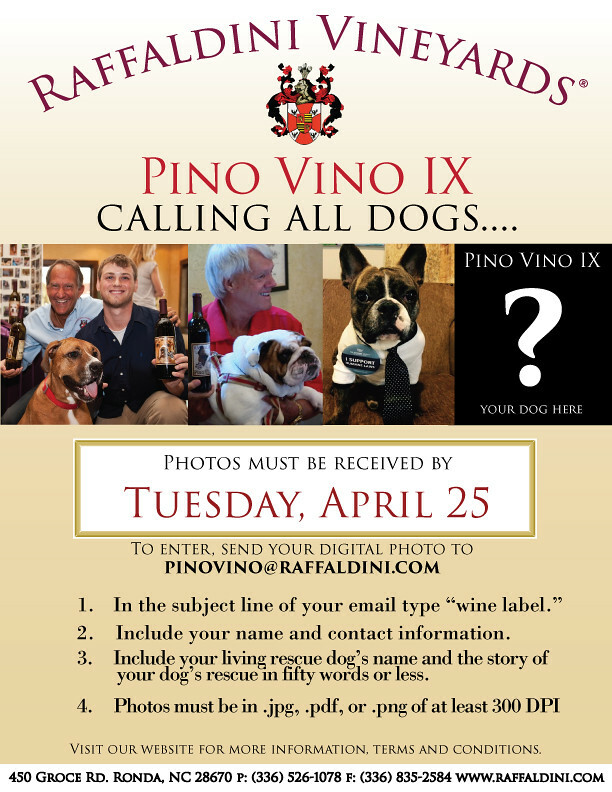 For the last decade Raffaldini Vineyards has officially supported local animal rescue organizations by donating proceeds from the sale of each of its Pino Vino wine releases. The first label featured Pinot, who Jay and Maureen Raffaldini rescued from a kill shelter when she was 1 ½ years old. Over the following eight years the photos of different rescued pets have graced our labels. Each one, along with the hundreds of submissions we received had a moving story and illustrated the love and dedication so many of you have for helping abandoned and abused animals. We thank you for your continued support and have been honored to host these yearly releases. 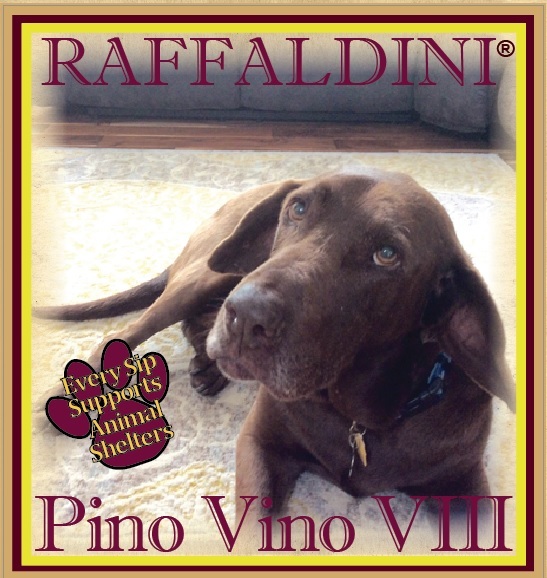 On this 10th year we will once again feature a dog rescued by the Raffaldini family on the label of Pino Vino X. Pino Vino X will also be present for lots of pets and kisses. Please join us on June 16, 2018 for a fun filled family afternoon when we release Pino Vino X.
April is National Child Abuse Awareness Month and Raffaldini Vineyards is proud to support Exchange/SCAN of NW NC. Exchange/SCAN (Stop Child Abuse Now) is a local, non-profit United Way partner agency with a 35-year track record of making the world a better place for our children. Exchange/SCAN (Stop Child Abuse Now) provides more than 20 different services or programs to prevent and treat child abuse in northwest North Carolina. The majority of services are free to the community. Volunteers are used extensively for their ability to give individualized care and in order to involve the community in the prevention of child abuse. Questions or referrals? Call 336-748-9028. Click here to learn more about SCAN and the Spring Gala. Patrick's family was of Roman decent and lived in Roman-occupied Britannia. As a adolescent, Patrick was taken prisoner by an Irish tribal king and brought back to Ireland. Eventually freed, after a religious pilgrimage to Rome he was appointed a Bishop by Pope Celestine. The story goes that during one of travels in Ireland, Patrick and his followers encountered an Irish tribal king who thought they were there to rob him. However Patrick held out his hand, smiled at him, and the tribal king saw a golden aura around Patrick, and thus the tribal king became the first convert of Patrick in Ireland. Patrick would use the clover in his missionary work which is how the symbol is associated with him today. Click here to learn more. We invite you to celebrate the feast of St. Patrick with us on Saturday, March 17. March 24 marks the tenth anniversary of Villa Raffaldini, help us celebrate and enjoy a complimentary dessert. New wine releases are on the menu and Snack Wagon will be on site serving up some of your food truck favorites. Share your memories of Villa Raffaldini with us on social media using the hash tag #VillaRaffaldini. We will collect and share everyone's memories on the big day. An Easter egg hunt for the kids will take place on the lawn following brunch at 2:30pm. A traditional cheese rolling for the adults will be at 1pm & 3pm. We have three brand new wines on the tasting menu that have been wildly popular in the tasting room the past two weeks. You won't want to miss an opportunity to experience these unique wines. Liguria is our Vermentino-based blend named for the province in Northwest Italy where the Vermentino is the predominant white wine. It is a high-acid, refreshing sipper, perfect for warm weather. Our Sagrantino grape is back in this "Super Umbrian" carefully blended with Montepulciano and Petit Verdot. This wine is a fitting tribute to wines from the region with immense power and structure. This "Beautiful Mix" is a delicious, dry red wine with restrained tannins and fruit perfect for those informal get togethers. Your friends and neighbors will be delighted by the fresh, vibrant fruit flavors delicately balanced with skillful oak aging. 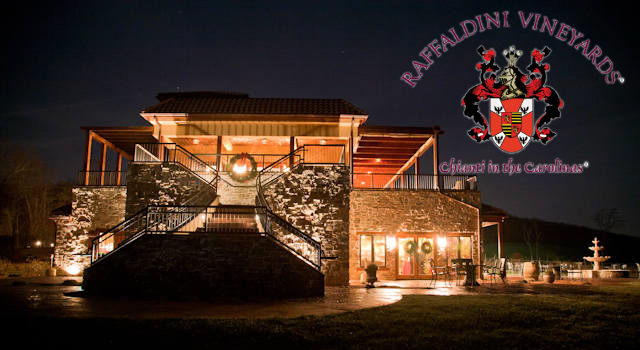 Raffaldini Vineyards is proud to be the Official Wine Sponsor for Carolina Breast Friends. Carolina Breast Friends serves to reach and empower all in our community are affected by breast cancer. The mission of CBF is to serve the breast cancer community in a positive environment providing education, encouragement and friendship during any stage of the journey. Owner Jay Raffaldini and JW Ray, owner of JOLO Vineyards, longtime friends and winemakers, have worked tirelessly on a wine that expresses their shared passion for the art of winemaking. We are excited to announce availability of our limited production, red wine collaboration with JOLO Vineyards, RARA Sisboombah. Also available is a select Riedel glass featuring both the JOLO and Raffaldini Vineyards logos! Join Owners Jay Raffaldini and JW Ray as they unveil the second vintage of RARA, their collaborative wine blend. 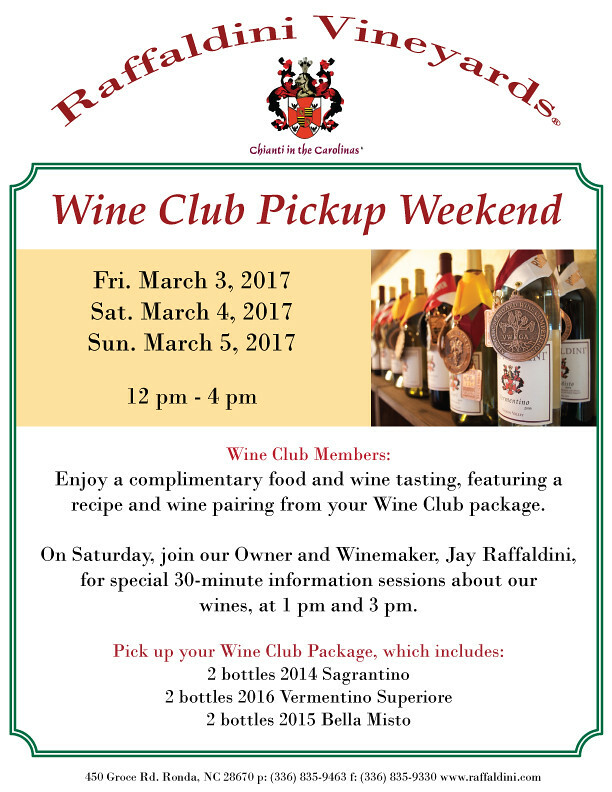 Enjoy a meet and greet with Raffaldini and Ray with signed bottles available for purchase. 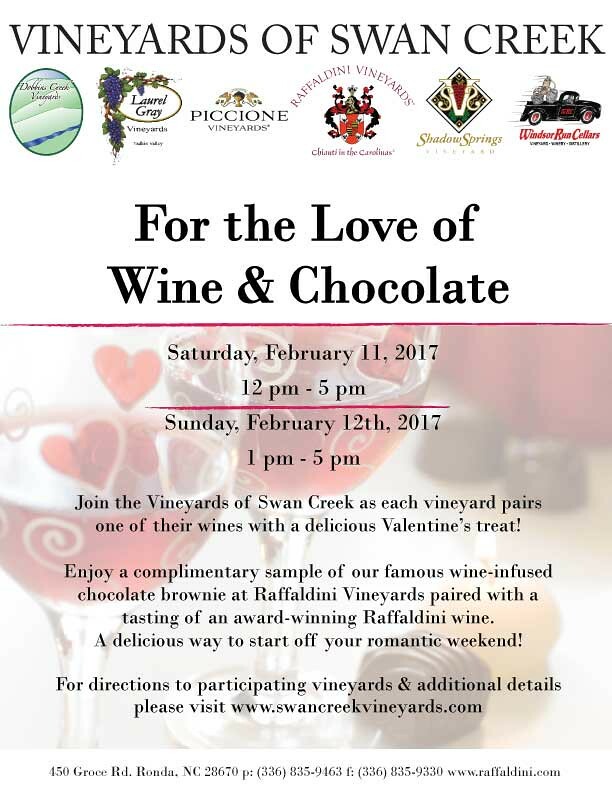 The event kicks off at Raffaldini Vineyards at 12pm and resumes at JOLO Vineyards at 2:30pm. Admission is free, but please RSVP. Winemakers JW Ray and Jay Raffaldini will unveil the second vintage of RARA, their collaborative red wine blend. Signed bottles will be available for purchase. Complimentary passed appetizers will be served. This special wine is expected to sell out quickly. Your best bet is to secure your bottle is to visit us this Saturday! Liguria is our Vermentino-based blend named for the province in Northwest Italy where the Vermentino is the predominant white wine. Liguria's cool climate also makes it a great place to grow Pinot Grigio, which is often blended with Vermentino. In a nod to this style of wine we blended some of our Pinot Grigio to create a vibrant wine with refreshing acidity that pairs effortlessly with seafood and white meat. Our Sagrantino grape is back in this "Super Umbrian" carefully blended with Montepulciano and Petit Verdot. Named for the home of Sagrantino, Montefalco, this wine is a fitting tribute to wines from the region with immense power and structure. This bold red wine will blow you away. Don’t miss the first opportunity to pick up your all-new Spring Wine Club package. Superiore Club Members will enjoy a complimentary food and wine tasting featuring one of the new Wine Club releases paired with a recipe from your Wine Club Package. On Saturday, join Owner Jay Raffaldini for a unique look into this new vintage and one of our 30 minutes information sessions at 1pm and 3pm. Join Owners Jay Raffaldini and JW Ray as they unveil the second vintage of RARA, their collaborative wine blend. 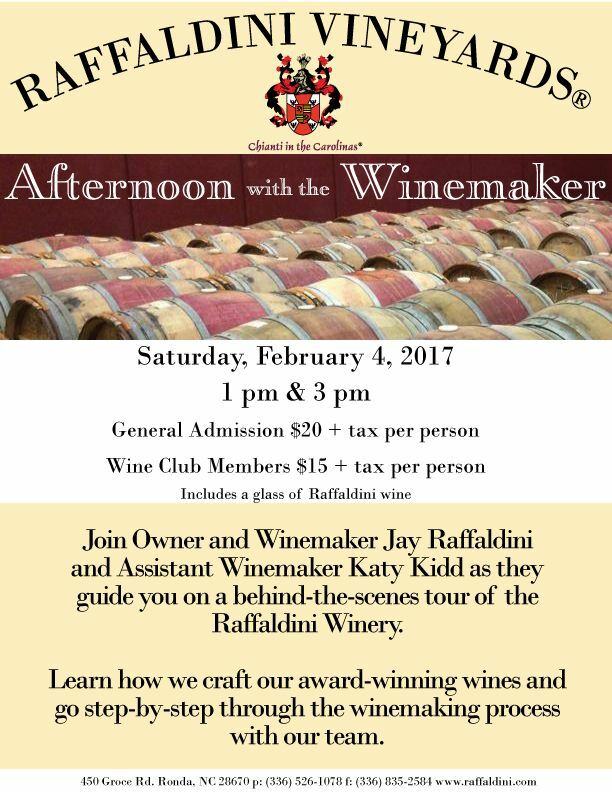 Enjoy a meet and greet with Raffaldini and Ray with signed bottles available for purchase. The event kicks off at Raffaldini Vineyards at 12pm and resumes at JOLO Vineyards at 2:30pm. Pre-Order our limited production, red wine collaboration with JOLO Vineyards, the RARA Sisboombah, along with a Riedel glass featuring both the JOLO and Raffaldini Vineyards logos! Only 30 glass/bottle combinations available for preorder! March 2018 marks the tenth anniversary of Villa Raffaldini, help us celebrate and enjoy a complimentary tiramisu dessert. New wine releases are on the menu and Snack Wagon will be on site serving up some of your food truck favorites. Share your memories of Villa Raffaldini with us on social media using the hash tag #VillaRaffaldini. We will collect and share everyone's memories on the big day. It's an Easter-Egg-Stravaganza! Celebrate Easter and the return of Spring at Raffaldini Vineyards. Bring the whole family and feast together over an Italian-style buffet brunch along with award winning Raffaldini wines. An Easter egg hunt for the kids will take place on the lawn following brunch at 2:30pm. A Traditional Cheese rolling for the adults will be at 1pm & 3pm. Bookmarks, a literary arts organization that fosters a love of reading and writing in the community, opened its new home in July 2017 at 634 West 4th St., Suite 110, Winston-Salem. The newly-renovated, 5,000 square foot space houses its executive offices, a community gathering space and a nonprofit, independent bookstore. Bookmarks produces the largest annual book festival in the Carolinas, an Authors in Schools program reaching 8,000 students of all ages, and a series of events with bestselling and award-winning authors. Since 2005, Bookmarks has brought more than 650 authors, illustrators, and storytellers to Winston-Salem, North Carolina. Raffaldini is honored to support Habitat for Humanity's "Habitat House Party," on Saturday, March 24 at the Milton Rhodes Center for the Arts in Winston Salem. All proceeds from the event help build strength, stability and self-reliance for a hard-working and deserving family in Forsyth County by helping them purchase a decent and affordable home. There will be music, an open bar featuring Raffaldini wine, appetizers, and a silent auction. Click here to buy tickets or support Habitat.